Safe Scrub Bug & Tar Pad can be used on glass, chrome, vinyl, fiberglass, paint and clearcoats—100% safe when used with soapy water. 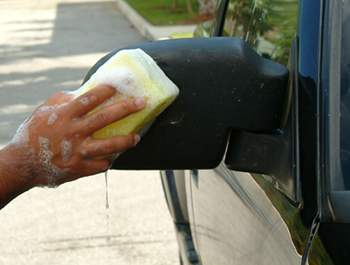 If you cherish a spotless car, this is one car care accessory you can’t live without! The Safe Scrub Bug & Tar Pad is your greatest weapon against bugs, tar, and other sticky contaminants. Remove bugs and tar easily with the honeycomb texture sponge soaked in soapy water for lubrication. The Safe Scrub Bug & Tar Pad should be in every detailing kit! I first put it up to the ultimate test--my ’64 Ford Falcon. (It has seen better days, but it’s part of the family.) I dunked the Safe Scrub Bug & Tar Sponge in some warm, soapy water and approached. Tentatively I touched the scrub to the bumper. As I agitated the surface, right before my eyes, the gunk that had accumulated (and I assure you this was no minor speck or two) was sucked into this amazing scrub. And, true to its name, it was completely harmless to the surface of the car. And, yes, I now use it religiously on all my vehicles, including the Corvette. I’ve yet to come across a less painless, more efficient way of removing harmful baked on bug, tar and road scum. 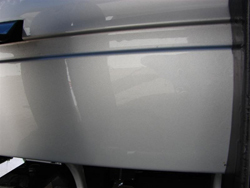 Considering the ease and gentleness this product, the Safe Scrub Bug & Tar Pad can be used daily to your vehicle completely free of bugs and tar that adhere to the surface and eventually eat into the paint. Use it on all painted surfaces, glass, trim, wheels and tires. The effectiveness of this scrub against all manner of residue, road grime, and bird droppings defies explanation given its non-abrasive nature. You’ll be amazed. The open-cell construction grabs at foreign matter on your car and pulls it safely away. It’s the perfect companion for your wash mitt—throw it in your bucket, and pull it out when you encounter stubborn grime. A more thorough shampoo! Just look at it after you’ve used it on rough areas and you’ll be shocked at the amount of residue it has removed, without having to scrub hard or use special formulas. 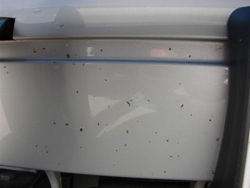 In this sequence, you can see how the Safe Scrub easily removed bugs from this bumper. 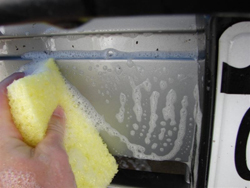 The Safe Scrub Bug & Tar Remover can be used on glass, chrome, vinyl, fiberglass, paint and clearcoats—100% safe when used with soapy water. When finished, rinse clean. Your Safe Scrub can be reused many times. It works wonders on household windows (especially exterior). It makes an unpleasant job a whole lot easier. The pads work with very little effort and no scratches to the paint! ...usually don't go for products like this, but glad I did! Inexpensive enough that I got (2), and with free shipping was a no-brainer... Worked well, but a bit bulky, so I cut one in half & is now much easier to grip. Quick shipping and worked as described!!! Works really well getting tough stains off- like tar, bugs, etc. Does not appear to scratch surface at all. Would buy again. This works outstanding when coupled with a bug remover spray. This safely lifts bugs and tar without trapping all of the crap in the sponge like some other products available. I like it so much I bought a second one, so I have one for each car. I saw this advertising on Auto Geek and since I was going on a road trip I know that I would have bug juice on my truck when I come back home. This sponge cleaned my truck and it did not scratch.